It's a Wonderful Life is a Christmas Classic with capital Cs, but its romance is often underrated. So this month's Cinema Style is dedicated to that moment when George Bailey met his fate and first fell in love with Mary. While life isn't all roses (and even when it is, those roses can cause little girls to walk around in the cold and get sick, as this movie shows), whengetting married, these two support each other in creating a truly wonderful life. 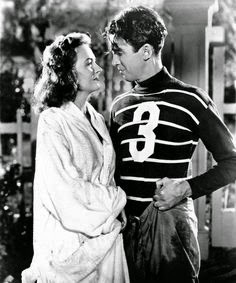 After an unexpected dip into the high school pool, the duo walk home in borrowed clothes, which for Jimmy Stewart means a borrowed football uniform. Somehow the moment of falling in love seems so much more genuine for the fact its not perfect, but let's be honest. You could totally rock the look of a varsity sweater. 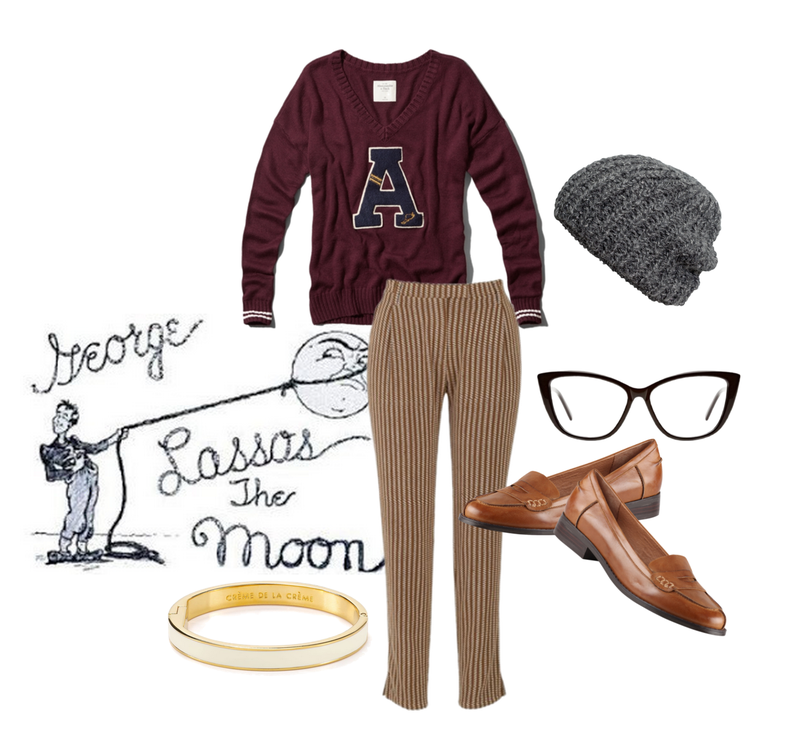 Add some striped brown pants to up both the casual and retro vibes. Then, a beanie would keep you both fashion-forward and cozy as can be while a bit of understate jewelry gives a lady-like touch to this film-inspired look. Before Mary ended up in the pool, she was dancing with George in a frothy tea-length dress, similar to this one from Unique Vintage. To update the classic shape of the dress, add ankle boots, and a jean jacket. Then, finish things off with a dash of color and flash of gold with your jewelry. Ooooh! I want some penny loafers! Can't wait to see you style them on your blog! Ah...the one Christmas movie I truly do like to watch every year...even if it makes me cry every single time. Aw yes, I love this outfit recreation, Kristian! That sweater is especially delicious. I think it is very nice of you to be going through the backlogs to read my blog, actually! Thank you Ali! These are always my favorite posts- I love seeing how you recreate looks around these iconic scenes :) Also, I love the idea of actually getting to wear one of these items, and knowing I'm channeling one of these romantic characters. It's such a fun and charming idea! I am so glad you like this series. And all your comments make my day. Seriously!